Flexibility is one attribute that no office should be without. You should be able to arrange and rearrange your office space to suit ever-changing needs, whether you need several small work areas or a large communal area for impromptu meetings. 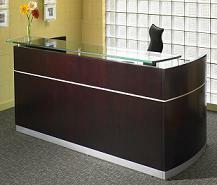 Office modular furniture gives you the flexibility to do just that and much more. Modular office furniture makes it easy to expand office spaces or create large communal work areas for collaborative projects. Thanks to stylish, comfortable modular tandem seating or training room tables, creating a comfortable yet flexible work environment is simple and straightforward. Office modular furniture comes in a variety of styles and colors that come together to create a warm and inviting environment. Whenever you need to break up large areas for semi-private office space, office partition panels can give employees a small measure of privacy and quiet. Contact us to learn more about our available selection of modular furniture and office partition panels.